Examine how the role of the older person is changing in our society and volunteer-involving organizations. Contemplate if the volunteer roles in your organization contribute positively to the lives of older people. See how a sample of volunteer-involving organizations in Australia present themselves to potential senior volunteers. Positive Ageing: Think Volunteering demonstrates that seniors who volunteer gain as much as they give. Written and published in Australia, the book applies to readers all over the world. It is designed to dip in and out of, depending on the reader’s interest area. It will therefore have wide appeal for retirees and retirement organizations, current and potential volunteers, workers caring for the aged, organizations involving any type of volunteer, and Energize’s main audience: leaders of volunteers. Leaders of volunteers will find this book useful for focusing on involving an older generation of volunteers. 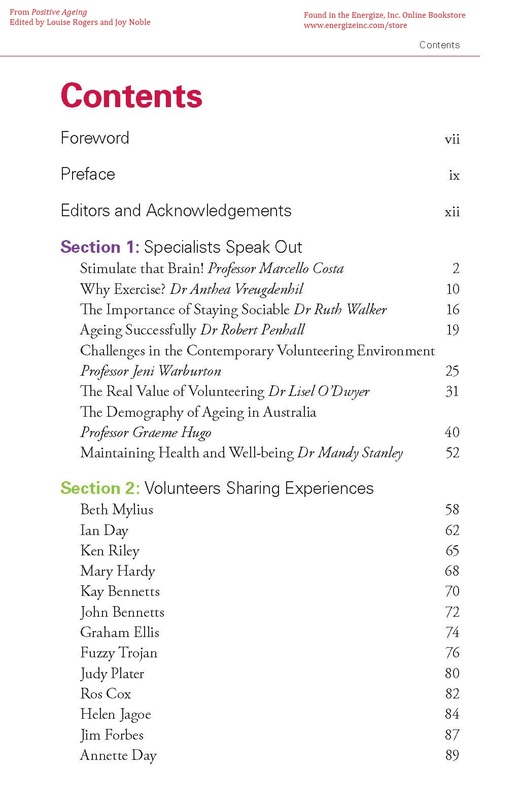 The first section, “Specialists Speak Out,” offers things to consider when developing new ways to recruit and involve seniors into service, including the findings of a range of studies on aging. The points raised will add new things to say in your recruitment campaigns and recognition events. The second section, “Volunteers Sharing Experiences,” presents a set of personal testimonials from a diverse group of volunteering seniors. While written for seniors who might be reading the book (encouraging their community engagement), some unusual projects are described that can inspire creativity in volunteer engagement professionals in designing volunteer work. 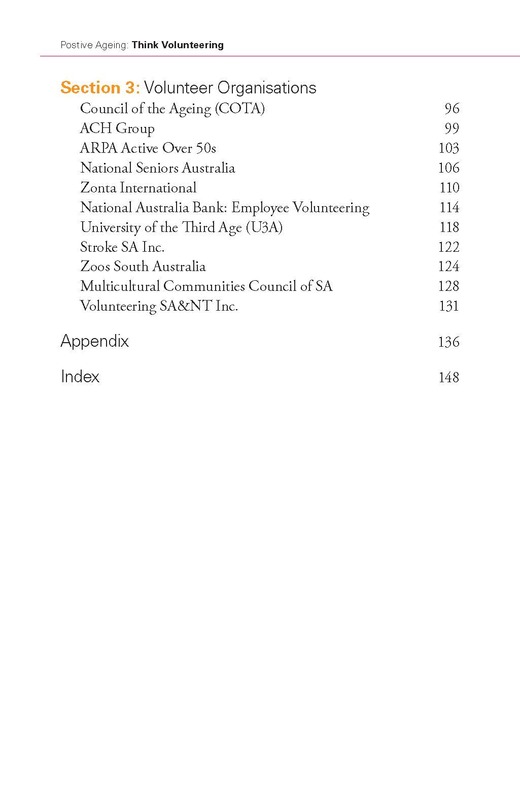 The last section, “Volunteer Organisations,” looks at Australian not-for-profit organizations and agencies serving older people. These stories can serve as models or ideas for volunteer-involving organizations wishing to broaden their appeal to older communities. "This is an excellent resource to inspire and motivate older Australians to be active through volunteering. Older Australians have a lot to offer in terms of skills, knowledge and life experience and can make a strong contribution to their communities. Encouraging older Australians to be active through volunteering is not only good for individuals but is also beneficial to society and the economy."